Property Search on the TAD.org homepage is a versatile tool that allows for very specific to very broad results. However, many online users don’t realize that entering their key words / numbers to search is just the beginning of what they can do to get the results they’re looking for. 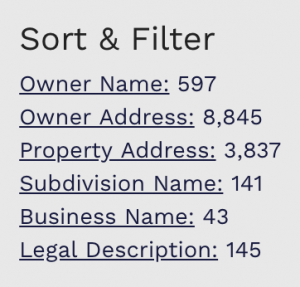 By clicking on either Owner Name, Owner Address, Property Address, Subdivision Name, etc., you (1) sort alphabetically / numerically and (2) filter by just the information category you want to view. Clicking the red “X” next to a specific property type removes it from your search results. 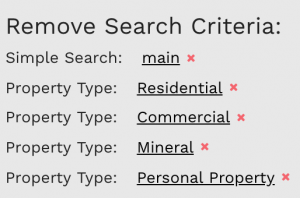 Try these and other features such as the Summary and List Views and different data download options to customize your Property Search experience.